According to China’s oceanic authority, the next step for the country’s deep-sea technology is developing and testing a drilling facility named Shenlong, plus a mining platform named Kunlong and an information-sharing system called Yunlong. China is getting closer to exploring the bottom of the ocean after a research mission deep in the Mariana Trench, the largest crack in the Earth’s surface that is more than 10 kilometers deep in the Pacific Ocean. 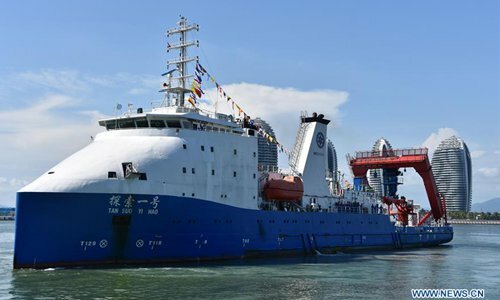 China’s oceanic research vessel Tansuo-1 returned to its home port of Sanya in southern China’s Hainan province last week, wrapping up a 54-day, 7,292-nautical-mile deep-sea research mission. During the mission a team of 59 researchers remotely piloted and grabbed some close-up looks into the Mariana Trench. Researchers from the Institute of Deep-sea Science and Engineering at the Chinese Academy of Sciences tested deep-sea equipment for geophysics, marine geology, geochemistry and marine biology. During the expedition, two 7,000-meter-class deep-sea gliders operated continuously for 46 days, making it the only abyss-class glider in the world proven to be able to work continuously for an extended period of time under the sea. A magnesium seawater fuel cell carried out two tests as the world’s first new metal seawater fuel cell tested in the 10,000-meter abyss. In addition, researchers also used a remote-controlled robot to complete high-definition live-streaming 10,000 meters down near the bottom of the trench. Earlier this year, Chinese media reported the development of underwater platforms to be launched after 2020 to take samples on the bottom of the South China Sea, as well as plans to probe the Mariana Trench. The People’s Daily has reported that China’s most advanced manned submersible, the Jiaolong, or “flood dragon” in Mandarin, was undergoing a retrofit at the National Deep Sea Center in the eastern coastal city of Qingdao. Its next dive will be in the deepest part of the South China Sea, a central basin with an average depth of five kilometers. The Jiaolong can dive up to seven kilometers deep. The launch of the Jiaolong is a landmark in China’s deep-sea exploration as scientists will be able to reach the sea floor for a closer look and complete refined sampling missions. 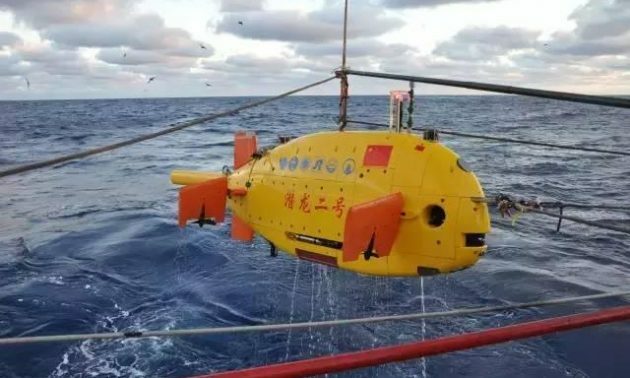 China is also developing a manned submersible that can dive to 11km and withstand the immense pressure with its sea trial scheduled in 2021, to “scour the bottom of the 11,034-meter-deep Mariana Trench,” according to the People’s Daily. In April last year, the Jiaolong finished three dives in the South China Sea. It normally carries three people, a pilot and two scientists. A dive usually starts around 7am and takes 10 hours. The three people inside can only move in a round, cramped space that has a diameter of 1.4 meters, said Gao Xiang, a senior engineer at the center. This equipment is expected to be finalized in 2020 and put into the South China Sea sometime after that.